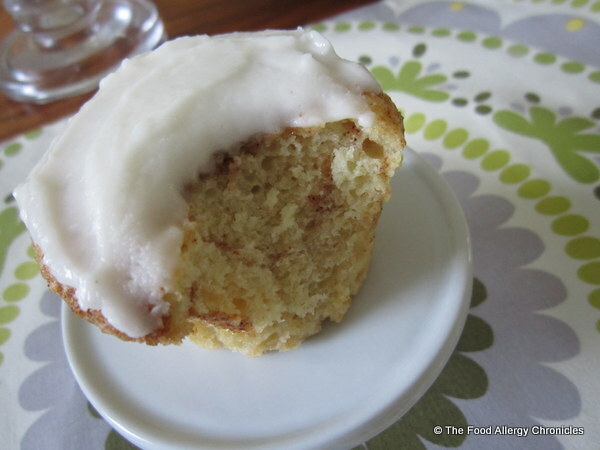 Posted on June 24, 2013 by Susan H.
Is it a muffin or a cupcake? Michael opted for Dairy, Egg, Soy and Peanut/Tree Nut Free Vanilla Cupcakes to take for his dessert at our postponed Father’s Day Family Dinner hosted by my husband’s sister yesterday. Click here for the recipe. I was thinking…what if I swirled in some brown sugar cinnamon in the middle of the cupcake…then again on top. Michael was not too keen on the idea but Matthew jumped at the chance to give them a try. 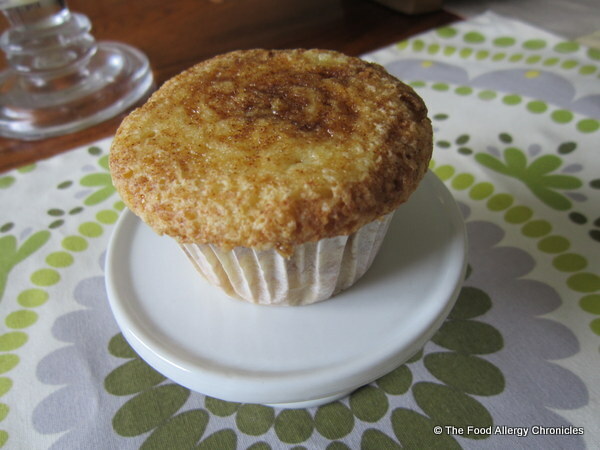 I filled three of the paper lined muffin cups with vanilla cupcake batter…Matthew sprinkled in some of brown sugar cinnamon mixture then gave it a swirl (1 tbsp. brown sugar mixed with 1/4 tsp of cinnamon). I topped them with more batter…Matthew sprinkled the tops with more brown sugar cinnamon and gave them a final swirl. 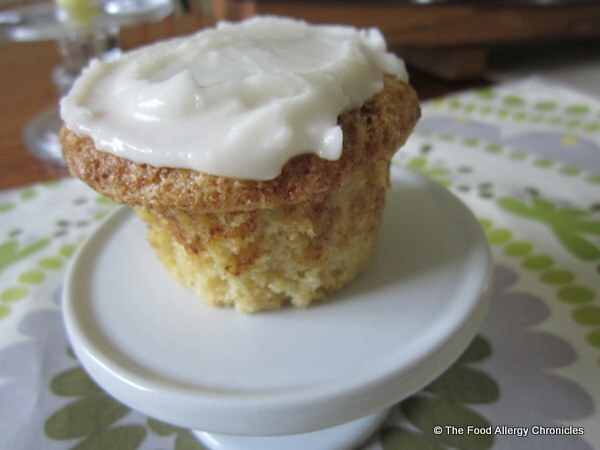 Topped with a spread of Dairy Free Vanilla Frosting…even better as a cupcake. 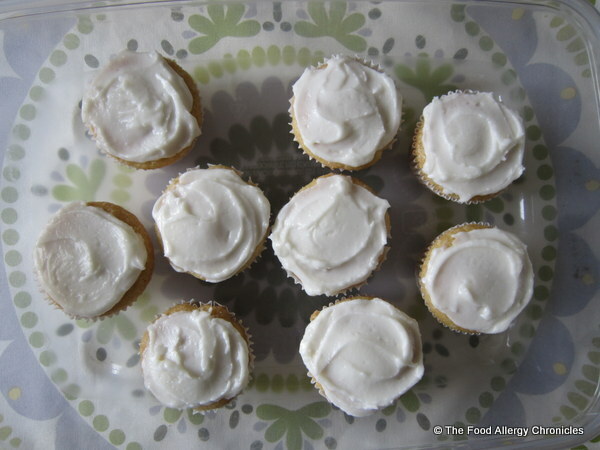 This entry was posted in allergies, Attending A Family Dinner Party With Food Allergies, baking, cupcakes, dairy free, dessert, egg free, muffins, multiple food allergies, peanut/tree nut free, soy free and tagged Dairy Egg Soy and Peanut/Tree Nut Free Brown Sugar Cinnamon Muffin/Cupcakes, Dairy Egg Soy and Peanut/Tree Nut Free Vanilla Cupcakes by Susan H.. Bookmark the permalink.